Was Jesus subversive? I am convinced he was! He was tried, condemned and executed in the same way as dangerous rebels against the imperial and religious status quo. 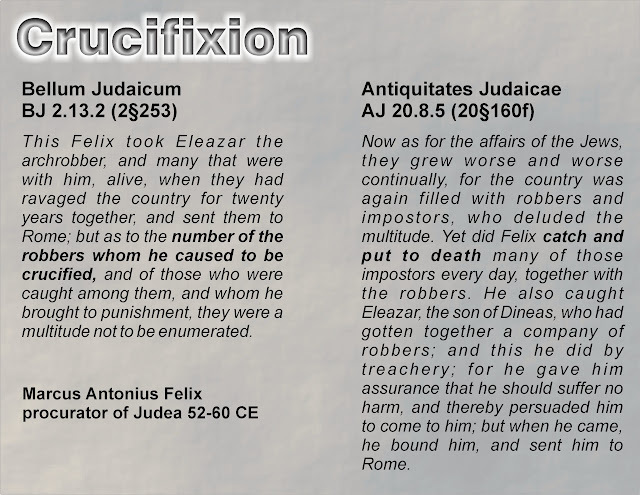 He was crucified by the Roman Imperial authority with quiet support from the leaders of his own religion. I believe that, in essence, the authorities understood him well and they felt appropriately threatened. I believe that Jesus intentionally subverted the corrupt, pompous, abusive Temple religion. I believe that Jesus intentionally subverted the brutal, arrogant and exploitative Roman Empire. He opposed everything and anything that was unjust, abusive, degrading and untrue. His primary instruments of this subversion were peaceful, nonviolence, blessing, forgiving, healing, and self-giving in love. But that did not make him any less subversive; actually it made him even more so! The authorities recognized it and decided to get rid of him, or at least they thought so. 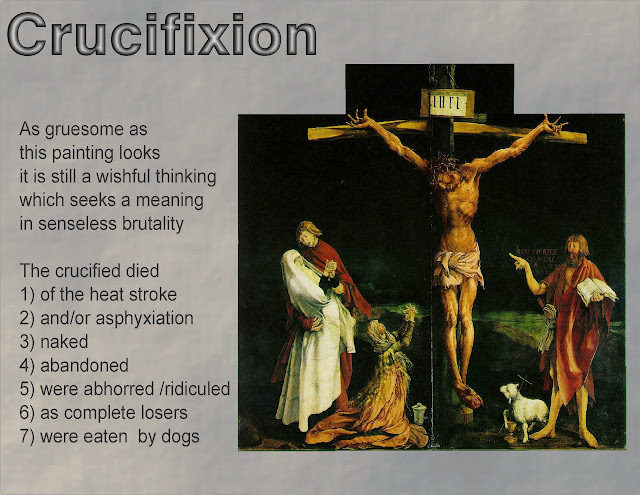 Their intimidating brutality worked for thousands upon thousands of crucifixions, but somehow it did not work this time. This one particular cross jolted the world from its axis. And it happened not by any power, but by weakness. You see, Jesus is subverting even the traditional images of God (Omniscient, Omnipresent and Omnipotent, and External to the world)! Jesus’ cross undermines it all. I believe that God is present and active in the world, not through any divine power, but in the divine weakness of self-giving love. For that very reason of the weak divine presence, Holy Friday is so important and meaningful. Проклятое поле (Cursed Field), 1878 painting by the Russian Historic-Realist Фёдор Андреевич Бронников (Fyodor Andreyevich Bronnikov). 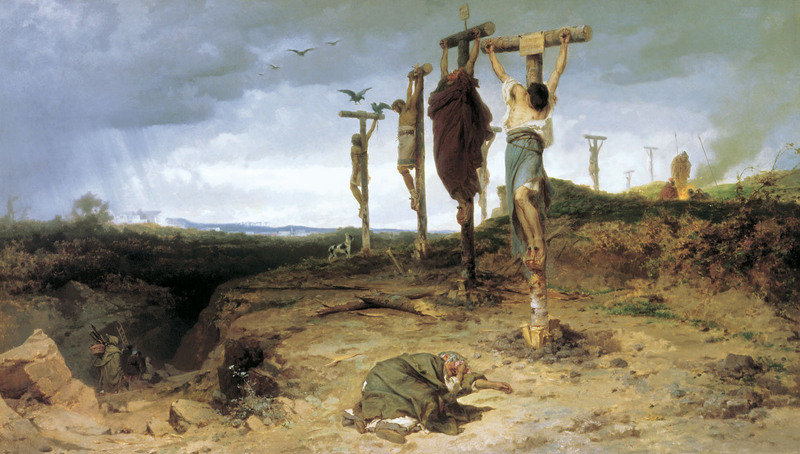 This painting captures nature of Roman crucifixions. It was not unique to Jesus, it happened to many subjugated or enslaved. 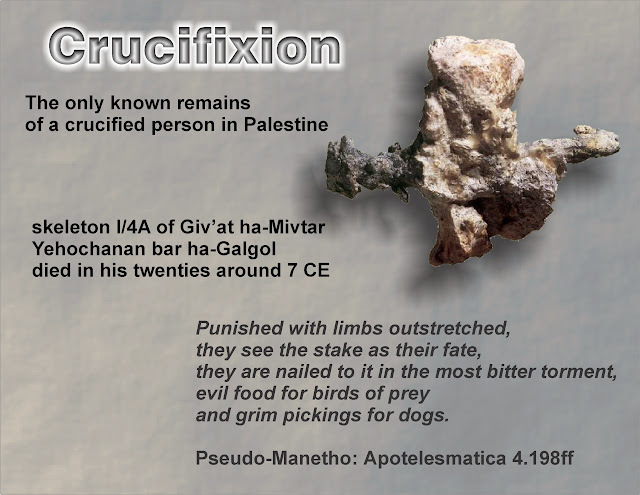 The crucified were not nailed through their palms, though, but were left naked to die and rot, as evil food for crows and grim pickings for dogs. This Sunday we will celebrate a special event in Jesus’ life. 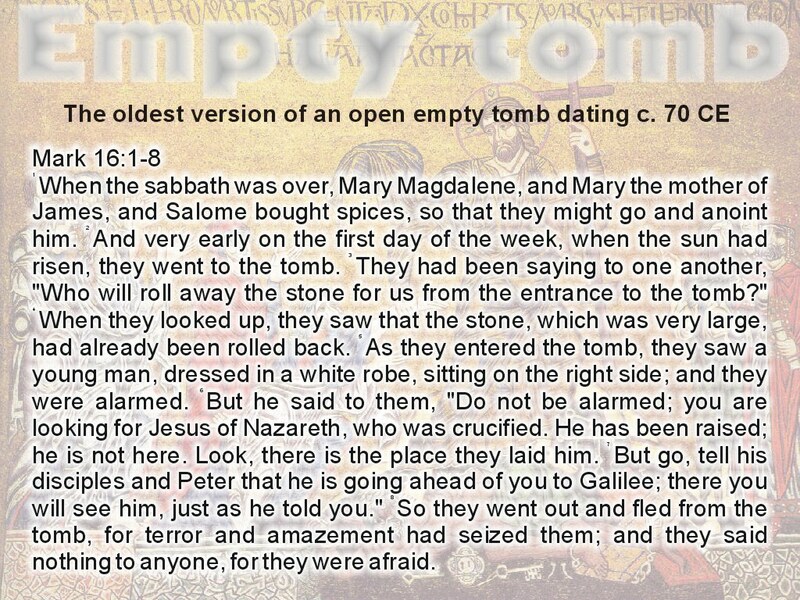 His joyful, prophetic and playfully political entry to Jerusalem just before Easter. Interestingly, an international news report from Jerusalem this week can help us better appreciate Jesus’ and early Christians’ sense of humor, their point of view and their hope-laden message. Earlier this week the President of the United States arrived in Israel for a state visit. He came on board of a special presidential plane (Air Force One) and his special presidential limousine was flown onboard another plane to carry him from one function to another. But the car broke down before the President arrived. Mechanics had hard time putting the car on a flatbed tow-truck because all the armor and classified gadgetry made it so heavy. Allegedly the Secret Service calls this vehicle “The Beast”. And it is a real beast indeed as officially it makes just 9 miles to the gallon, and don’t we all know how it is with these official numbers?! Thankfully, they keep several such “beasts” in the White House stables, because before that day was over, another identical limo was flown in. The President could ride into Jerusalem in another thirsty Cadillac Behemoth. Please, understand me well, I do not question the need for the security and privacy of any president, least of all the American. This was certainly a small incident in the president’s travel, but because it happened at this particular time of the year and at the entry into Jerusalem, the poignant difference between The Beast and a she-donkey can hardly go unnoticed. And please understand me well again, I do not think that this has anything to do with the president as a person, and everything to do with the timeless imperial institutions and structures (those societal realities which apostolic authors called ἀρχαὶ καὶ ἐξουσίαι “principalities and powers”). 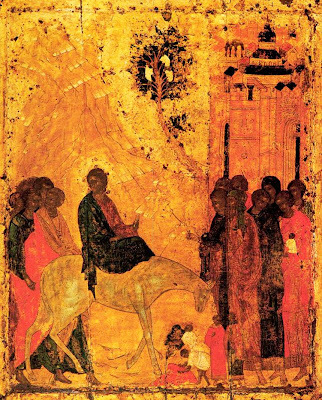 The timing of this presidential vehicle hiccup was just a coincidence, but I am convinced that the story of Jesus’ entry to Jerusalem was deliberately modeled on similar ancient ceremonies of pomp and circumstance. The entire story is built around the contrast between the official diplomatic protocols of the earthly empires and the spontaneous joyful welcome to the arriving kingdom of God. Days before “The Beast” broke down I called my Sunday meditation “Carbon-Neutral Visit” not knowing how funny and timely it would get (Church staff and some friends can confirm this.) Come this Sunday to celebrate coming of the spontaneous, gentle, hope-filled, different, and clearly alternative world of God. This is my opening thesis which I would like to defend, illustrate and expand in this lecture. The Mosaic in the St. Mark Basilica in Venice is a clear illustration of that powerful mytho-poetic imagery of the story of the empty tomb. The resurrected Christ (still with crucifixion wounds!) tramples on the personified Hades (who is bound), the gate of netherworld is broken, its lock and keys useless. Jesus is pulling/resurrecting Adam (and Eve) surrounded by other OT figures such as David and Solomon (two figures with crowns at the right side). 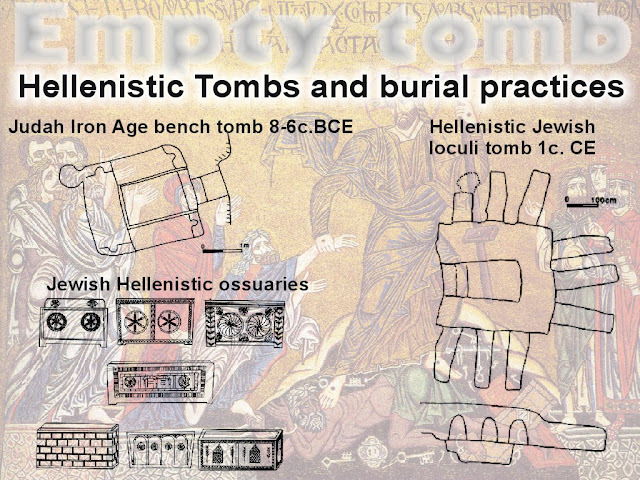 This is how the ancient tomb looked. Newer development allowed for a more efficient use of space. Tombs were expensive to make and were often shared by large families of clans. 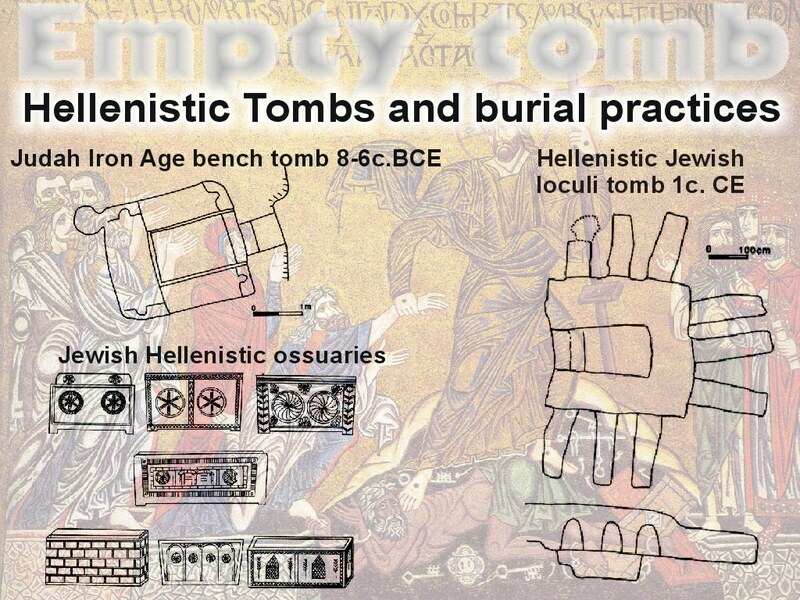 Ossuaries were boxes for bones after the body decomposed. This is the historically oldest known preserved story (and first ever mention!) 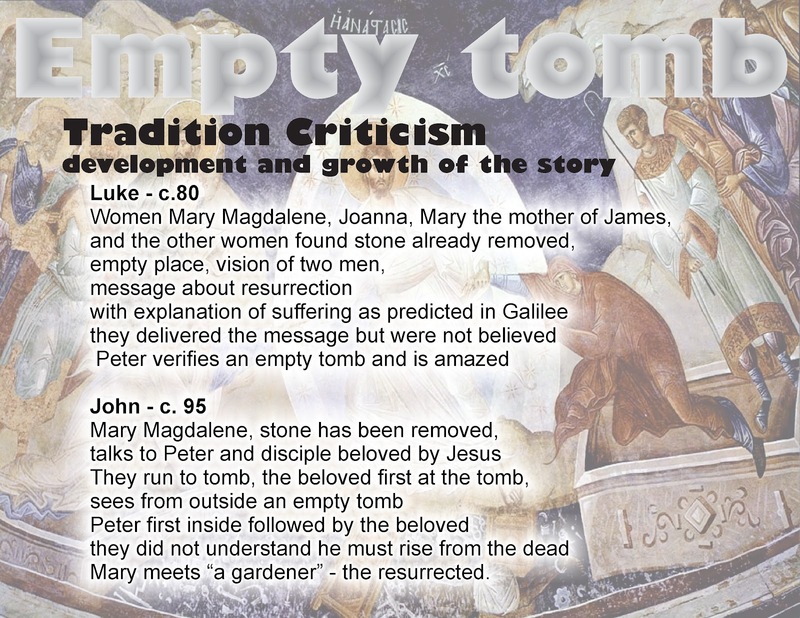 about the empty tomb of Jesus as translated by NRSV. It dates to the early 8th decade of the Common Era. 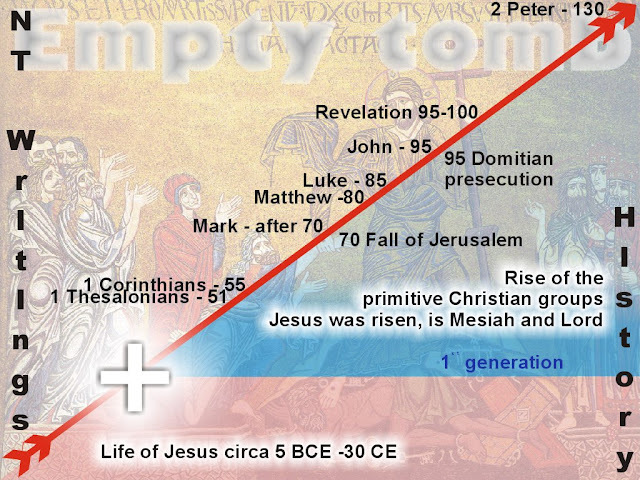 The diagonal red line in this slide represent the time axis of the early Common Era. Upper left side contains some events from the history of the texts which later became part of the NT canon. 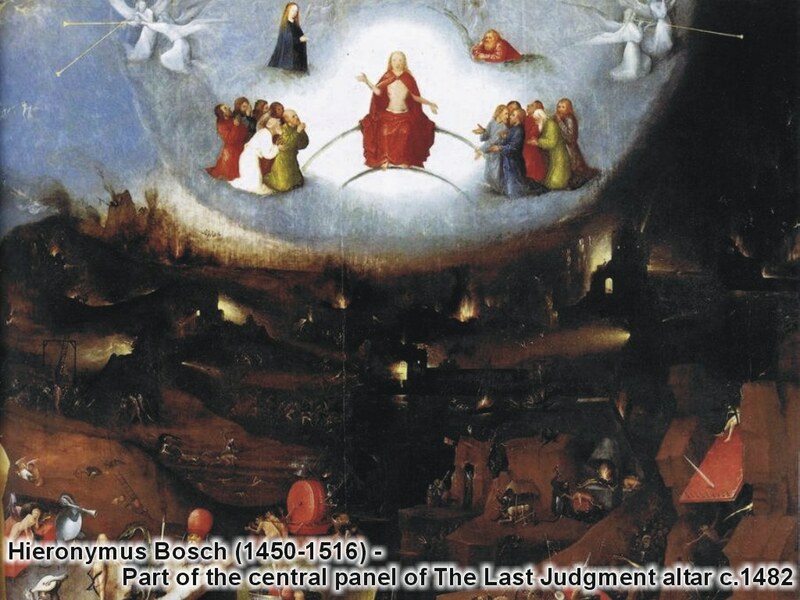 Lower right side represent some events important for early church and their relation to the passage of time. 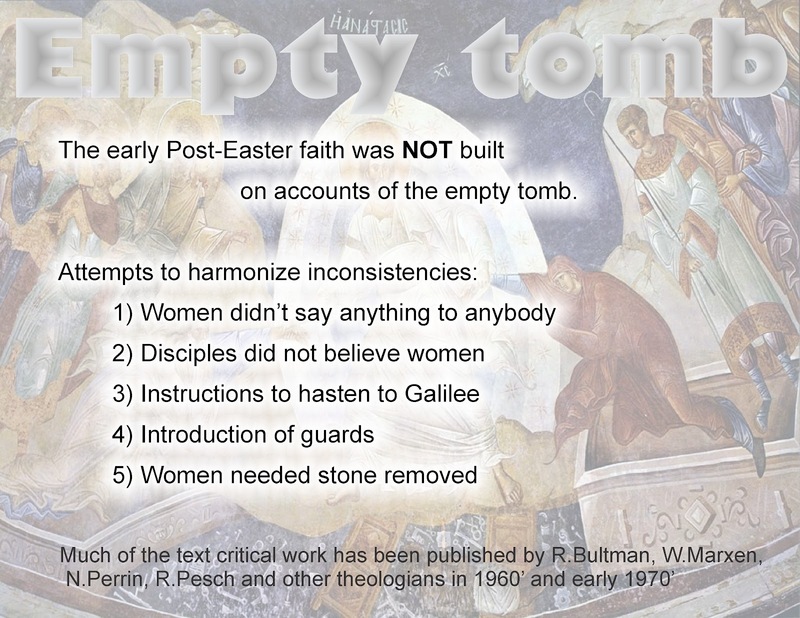 After the Easter Event, the first disciples struggled to find words to describe or even think about their experience. For them it was a completely new experience without the precedence and without adequate vocabulary. The first attempt to express their experience consisted in simple acclamations such as “Jesus is Lord” KURIOS IESUS! And the like. Later, the disciples developed simple statements or formulas such as “Son of God Formula” stating that the crucified Jesus was the Son of God. 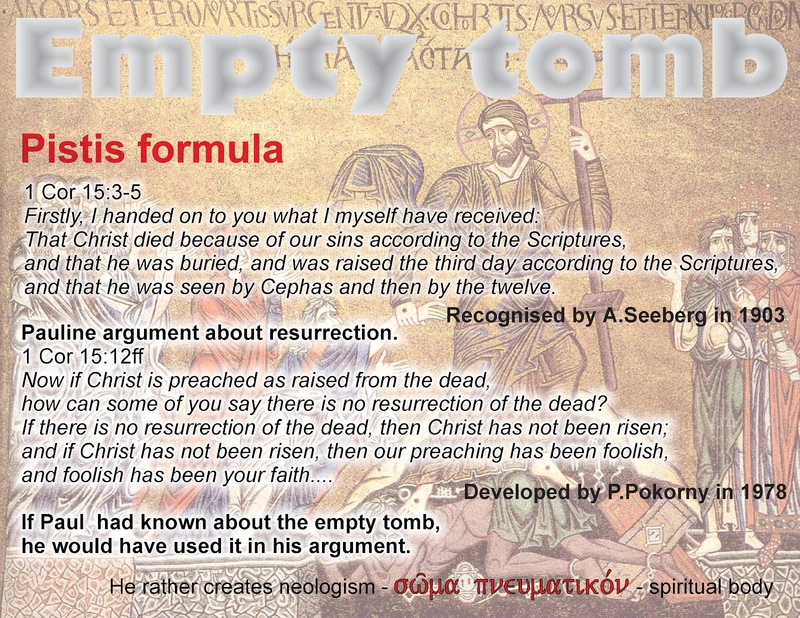 “Self Giving Formula” Jesus died for us, and the “Pistis formula” which is quoted on this slide. 1) Inspiration (the disciples felt a gift of spirit and they lost fear) the Pentecost tradition was originally closely associated with the Easter event. 2) Exaltation (The Crucified was lifted up to the divine presence, became Son of God etc.) 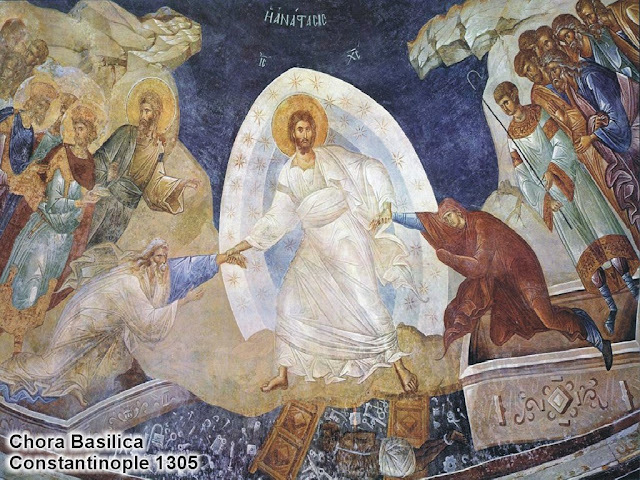 Ascension was also originally closely associated with the Easter event. The traditional Orthodox depiction of the Ressurection (H ANASTASIS). 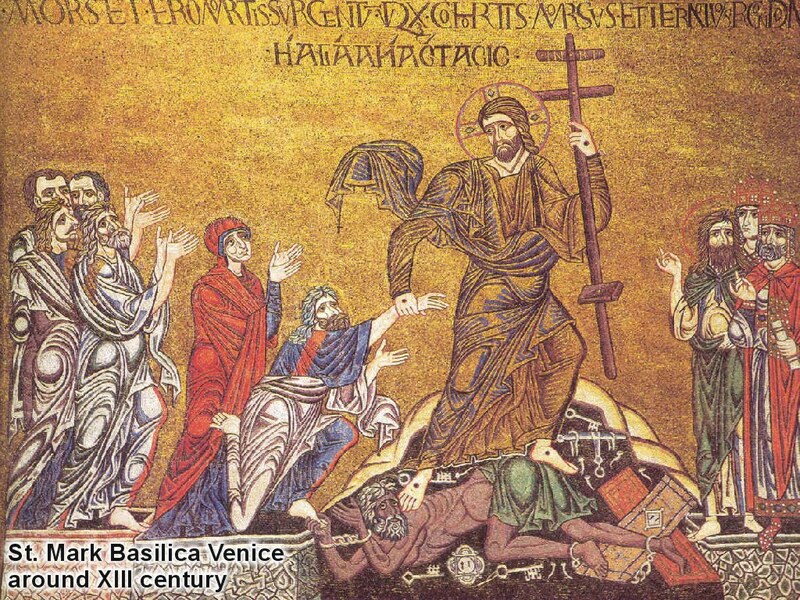 Venetian mosaic actually took inspiration from the broadly established orthodox mode of depicting the resurrection. These three slides represent outlines of the resurrection story as narrated in biblical and extrabiblical gospels. We can observe uncertainty about the number and identity of women. Gradual addition of male characters to compensate for legal untrustworthiness of women in patriarchal society. Development in the presence and moving of the stone. Changes in numbers and roles of angelic figures, introduction of the guards and attempt to explain their silence. 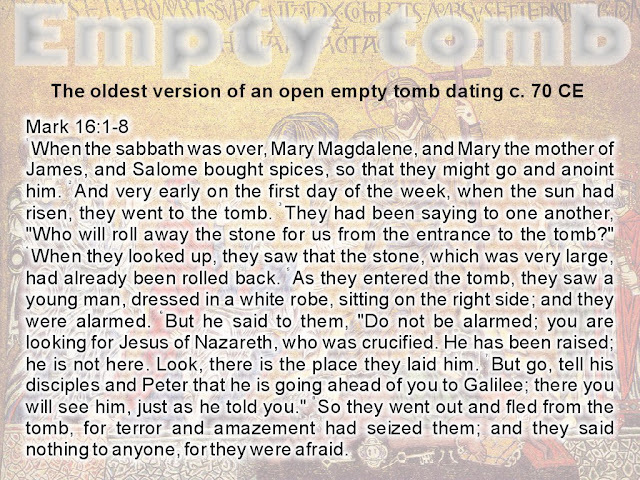 Similarly we can observe slowly creeping in antijudaism of the early church which is absent from the earliest accounts. 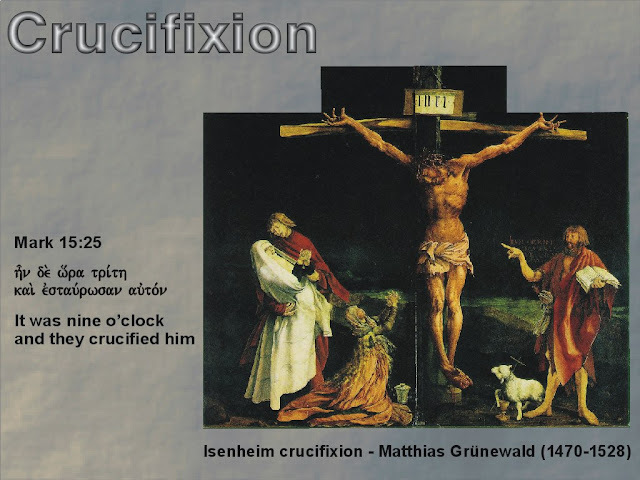 The text critical (more precisely tradition criticism) approach is further supported by the historical context and archeology of crucifixion as we discussed in the previous lecture. Minor inconsistencies in this explanation only strengthen it. 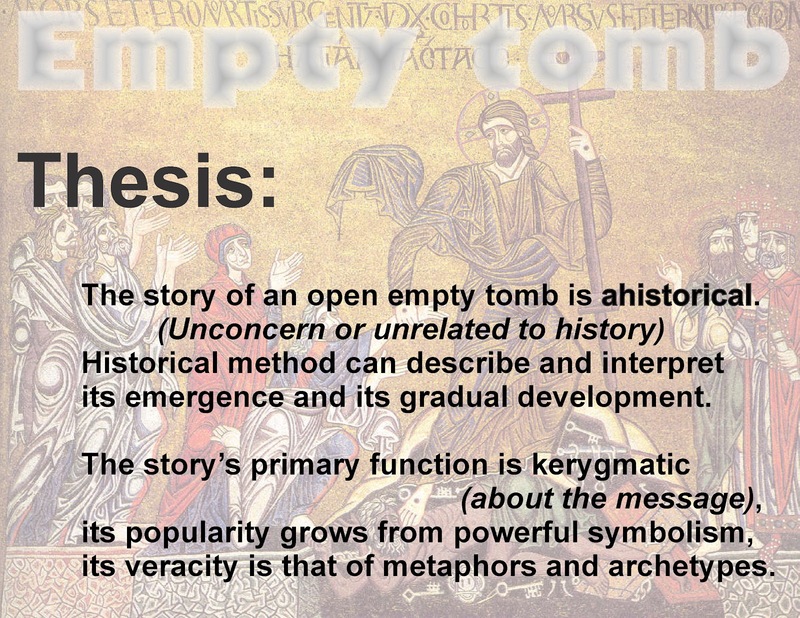 As we stated in our opening thesis: The story of an opened and empty tomb is ahistorical, (unconcern about matters of history). On the other hand the historical-critical method can help us describe and interpret its emergence and gradual development. The story’s original function was kerygmatic (sharing the message). Its popularity grew from powerful symbolism and its veracity is that of mythical metaphors and deep spiritual archetypes. Do you think that plants can hear and understand us? What a silly question? They do not have ears or nervous systems to process these sensations. Of course they cannot hear us! But when I moved as a minister to my first church, behind the manse and next to the church was a small neglected courtyard and in a narrow passage between a shed and the sanctuary grew an old plum tree. It was badly beaten by life, partly crooked, partly stooped, with a number of broken or dead branches. No one had taken care of it for very long time, at least for a generation. It was that kind of old traditional plum tree (Damson or Damascene they call it) with small purple shrunken fruits. Except there had hardly been any fruits on it. Ever! 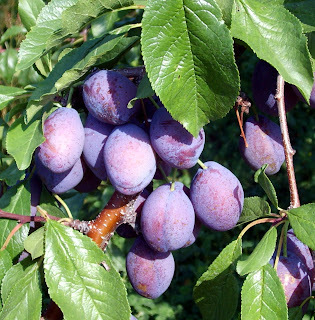 I was told that for years that whole tree would grow about a dozen little lonely plums and most of them would fall to ground before they ripened. When we moved in, we cleared the courtyard of the clutter, started to cultivate a lawn and were planning to put in place a terrace for some small church gatherings. I remember vividly standing one early Spring afternoon under the plum tree with the Clerk of session, custodian and some other gentlemen talking about the plan and also wondering why that ugly tree was still there. That Spring it was too late in season to cut it down. It is immoral, not to be done, to fell a tree after the sap just starts flowing. We resolved to cut this fruitless, ugly, nonsense tree first thing next autumn. It never happened. That year the plum tree was almost breaking under the weight of fruit. We spent several days harvesting that little tree. Every willing parishioner received a basket of plums. We dusted off some old plum recipes. I made my own "Povidla" (plum butter). The Session half jokingly discussed making our own Church’ "Slivovice" (Plum Brandy). And on the Google Satellite Map (The tree is under the green arrow) I see that the tree is still there and it makes me happy. So can trees hear us, can plants understand? I do not know. This experience would almost suggest they possibly can, but it could also be just pure coincidence, or perhaps result of other influences like cleaning the yard, cultivating the grass and simply people being around. I wish to think that it was not out of fear, but because that tree became happy for having more company. Jesus of the gospel of Luke is said to tell a parable about a fruitless tree, which shares an almost identical setting and introduction with my plum tree story. It is a parable about special granted time, about repentance, about a radical change of mindset (what French call mentalité). Come on this Fifth Sunday in Lent, accompanied by stories of fruitless tree, we will seek a new, non-anthropocentric outlook for our faith, we will seek to trace the outline of new eco-theology. This simple sentence covers great personal tragedy as well as tragedy of civilization seduced to terrorize its members into obedience. Based on archeological records as well as testimonies, aggression, brutality and violence have always been part of human nature and are well documented in primitive societies. Nevertheless only the emergence of large empires saw the development of brutality and violence into a complex calculated system. Large empires used violence and fear of violence as an important tool to control and govern large territories with diverse populations. 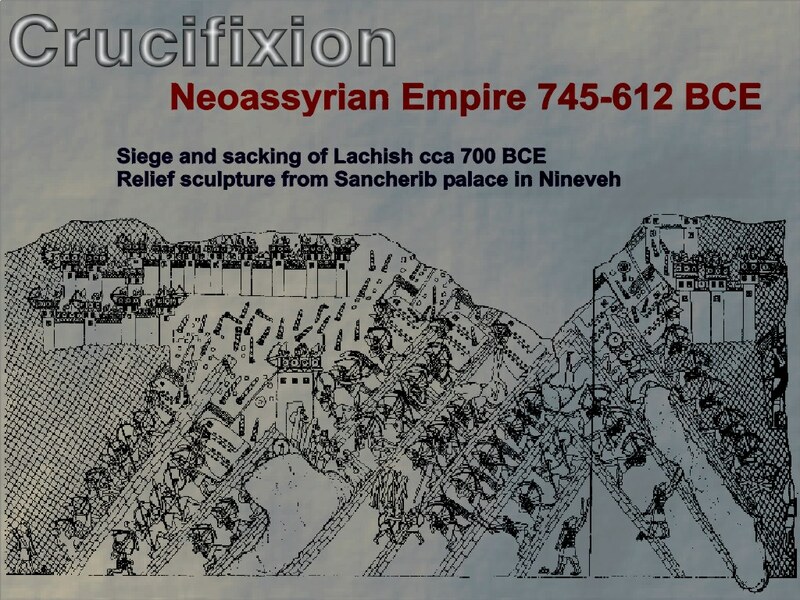 The Neoassyrian Empire can serve as one of the early and extreme examples of the systemic use of state terrorism for the purpose of governance. Assyrian depictions of hunting scenes or battle scenes were extremely realistic and also brutal. Accounts of their form of governance were built on fear and terror. Anything interpreted as disloyalty was severely punished. Here are just some details from the famous bas-relief of the siege of the Judean city of Lachish. Impalement or skinning alive were “proudly” depicted in gory detail. 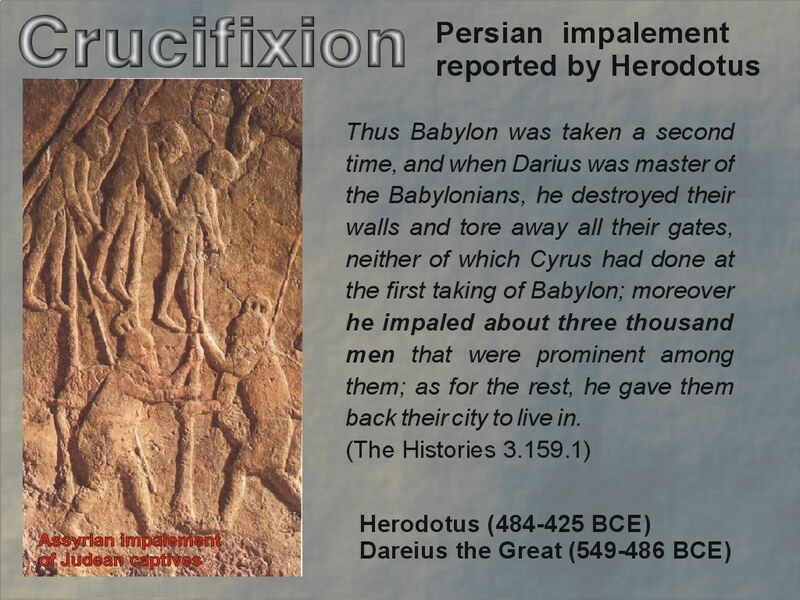 Impalement is conducted or attended most likely by Greek mercenaries. The biblical testimony as well as other ancient sources attest that the Persian empire was built on a more tolerant, pluralistic and mostly benevolent model. This situation, nevertheless, changed quickly when the hegemony of the empire was challenged. In need of exercising control, it quickly reverted to use of more violent and tested tool of dehumanizing terror. In this lecture I also use well-known pieces of art. Here Mark Chagall depicts and prophetically anticipates the upcoming unspeakable persecution of Jews in the Ukraine and Western Russia. 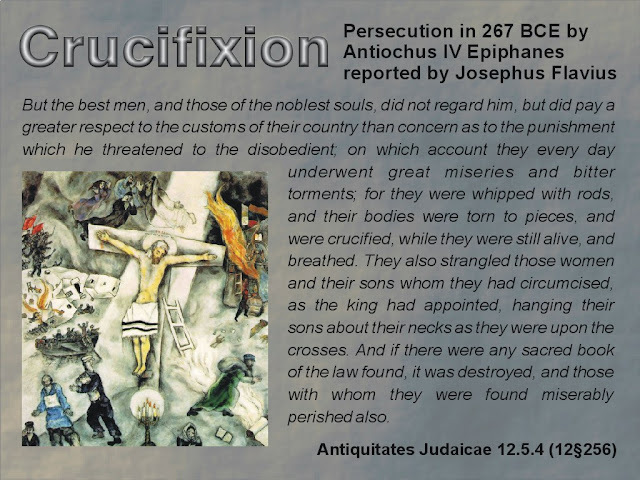 Report of the Seleucid persecution under Antiochus Epiphanes. 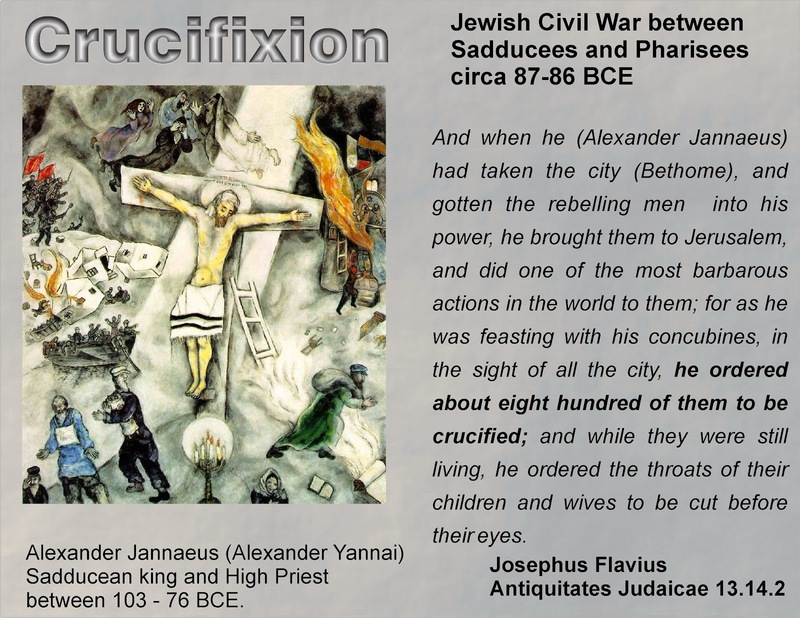 Unfortunately crucifixion was not used only by large empires to terrorize subjugated and difficult-to-rule populations. It became expedient way to treat and terrorize people into obedience. This slide presents an example of the use of crucifixion to terrorize political opponents within one society. Here is an biblical example, where David is implicated in reverting to this hideous practice. And the highlighted gloss tries to explain and also shift responsibility on outsiders. 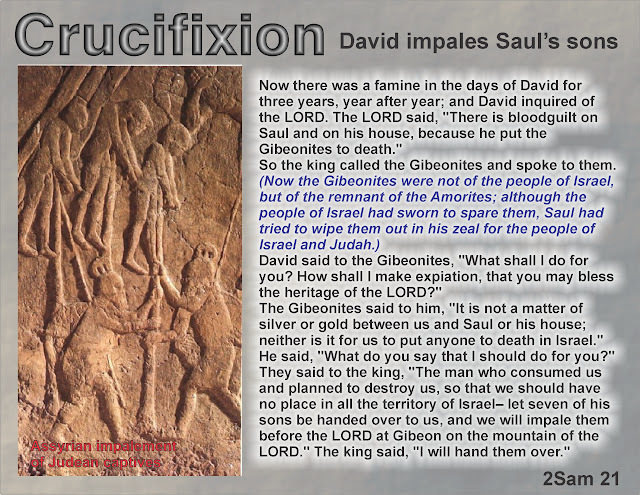 Although certain features of the story seem to be quite old, the crucifixion points to the Persian, perhaps even Hellenistic period of the authorship of the saga of the unified monarchy of David and Solomon (As text-critically suggested by John Van Seters and from the perspective of Near Eastern Archeology by Israel Finkelstein and Neil Asher Silberman. Crucifixion was widely used by Romans to govern subjugated and rebelling nations. These two texts report the same incident; one time Josephus speaks about crucifixion, the next time he uses a more indirect and circumspect way of speaking about it. 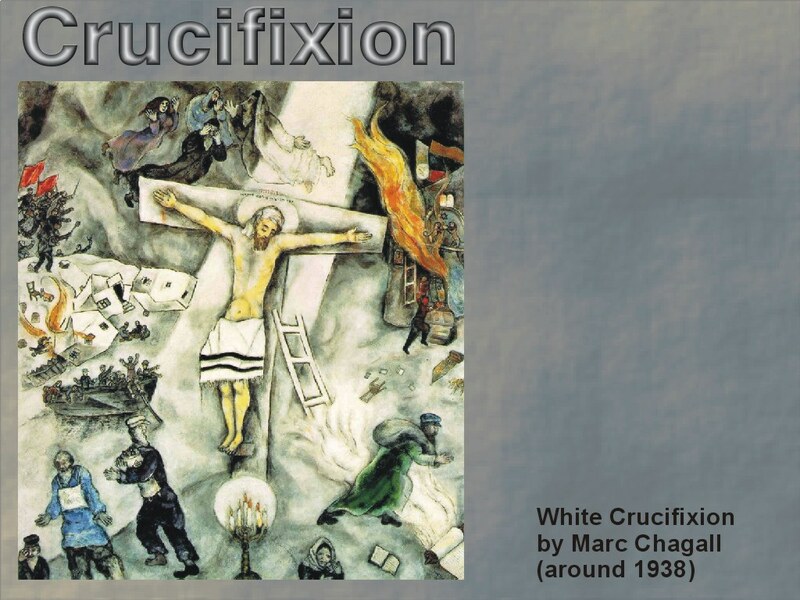 Clearly direct references to “crucifixion”are like the tip of an iceberg. Crucifixion should be often suspected even though it is not directly mentioned. 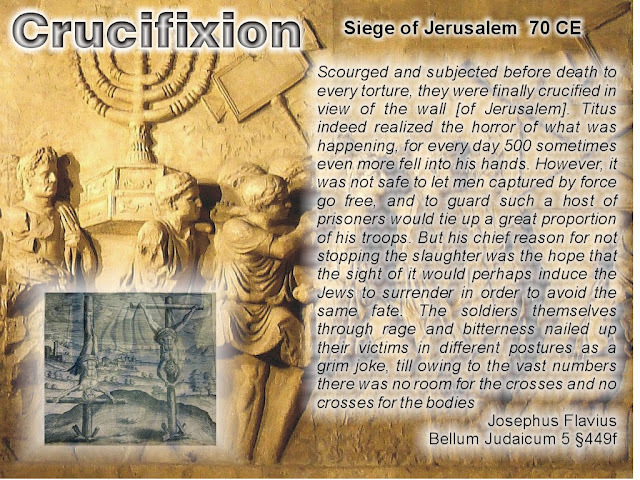 Josephus Flavius describes the siege of Jerusalem and highlights utilitarian (unable to keep them in camp) as well terrorizing (to instill fear) reasons for this gruesome form of execution. And even if we control for his notorious propensity to exaggerate, the total number of crucified during the six-month-long siege was undoubtedly large. 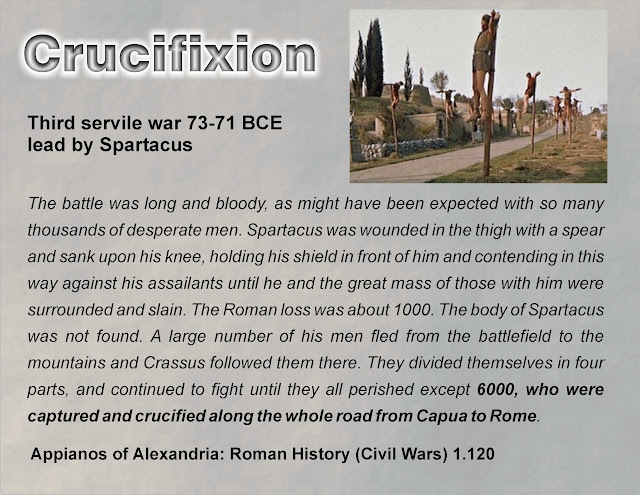 Roman taste for large exemplary and punitive (terrorizing) execution during or after suppressed rebellion is probably best documented in the aftermath of the Third Servile War, the famous Spartacus uprising. Again, numbers might be exaggerated although the distance between Rome and Cappua on Via Appia was about 120 miles or almost 200 km (that would mean a cross every 33 meters on one side or if both sides of the road were used, every 60 meters). With so many reported executions by crucifixion throughout ancient history, it is surprising that there is only one known skeletal remains of a crucified person. 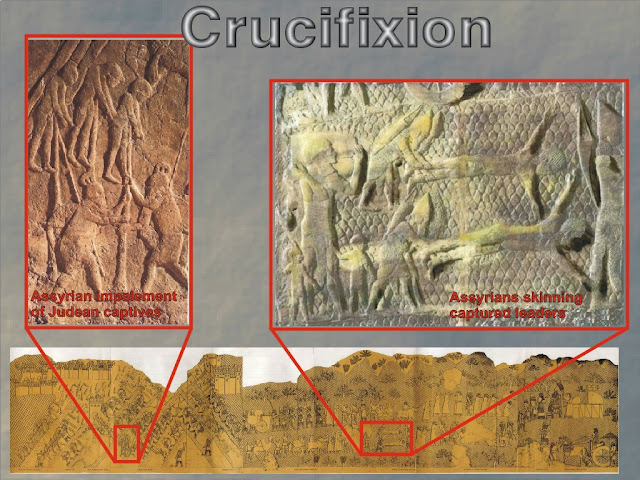 Even if we control for all the variables (not all crucifixion would leave skeletal traces, not all traces might be recognized and discovered etc) this discrepancy remains quite great. 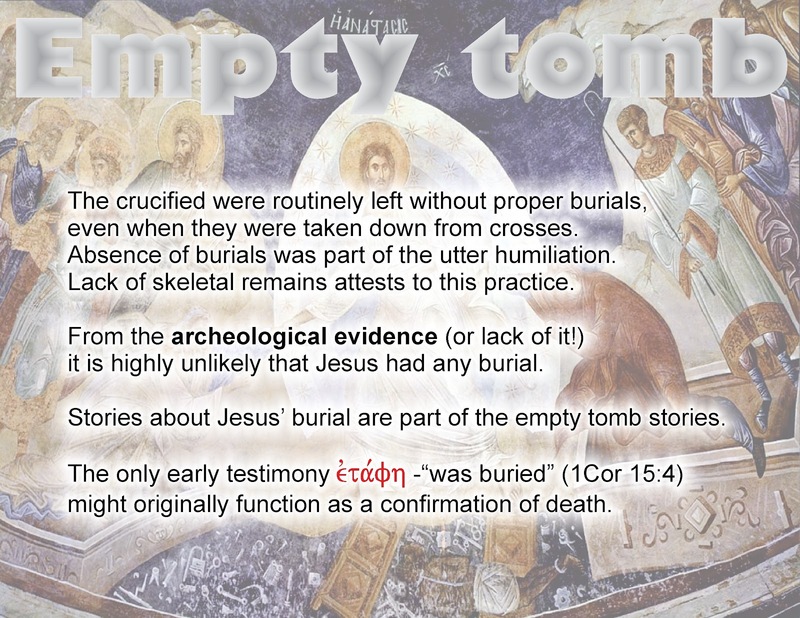 This absence of skeletal remains actually confirms the testimony of our few written sources which are describing crucifixion as an execution which resulted in the absence of a proper burial. The absence of proper burial was to ancient sensitivities substantial part of disgrace and horror of this type of execution. 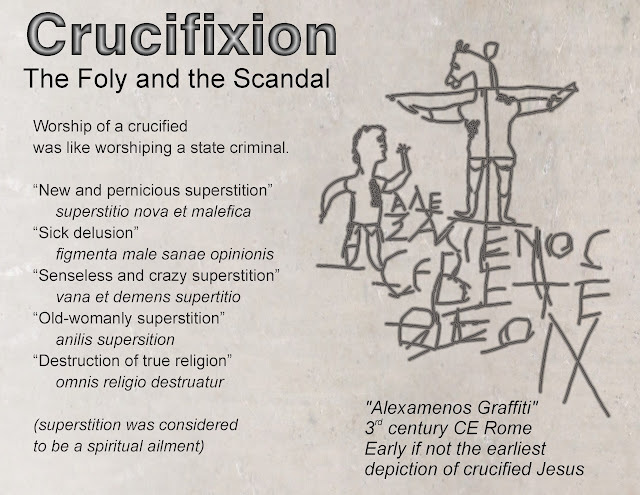 Within the context of Roman civilization this worship of a crucified person was a direct affront of everything this civilization wanted to represent and achieve. It had to be considered as a direct subversion of the very structure of Roman society. It would be similar to the worship of an officially condemned serious criminal or terrorist in our times. It was indeed a peaceful, none the less radical, dangerous and in the end very effective rebellion against the oppressive brutality and alienation of Roman civilization. Where in Manhattan are the most expensive apartments located? Well, most likely they are on the top floors. These top floors might be swaying in strong winds, but they are most likely to have nice vistas and a greater degree of privacy and quiet. These apartments are more expensive only because modern tall buildings are equipped with fast and efficient elevators. In New Testament times, Hellenistic apartment buildings (called Insulae) did not have convenient elevators and thus, just like in old tenement houses, rooms in the upper floors were the least desirable and thus cheapest. Unscrupulous landlords and developers neglected maintenance, disobeyed zoning and building codes (believe it or not Hellenistic cities had these norms - they existed in Rome) and overcrowded upper floors. Buildings were top-heavy and prone to collapse. 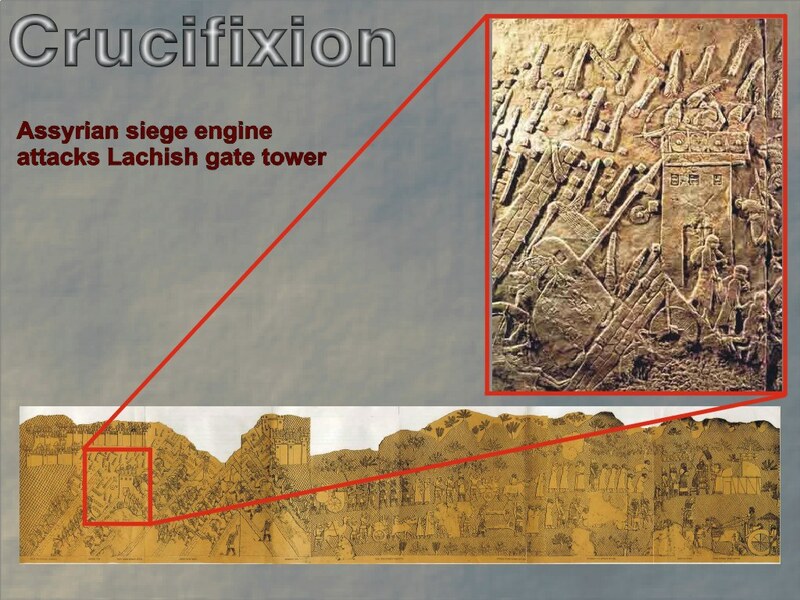 In the Gospel of Luke (the most deeply rooted in Hellenistic culture of all the Gospels) Jesus is said to comment on some similar urban tragedy - a collapse of a building/structure (tower) in Jerusalem with eighteen casualties. And then he says: “unless you repent, you will perish in a similar way.” That is a surprising conclusion, isn’t it? How could repentance possibly prevent the collapse of buildings? Either Jesus was stark raving mad, or he perceived God, whom he called Abba (loving father), as a dark, abusive, vindictive killing monster, or . . .? Or! All our traditional religious as well as cultural understanding of repentance might be quite seriously wrong. This Sunday we will search for Jesus’ model of repentance, a repentance which originates in the change of heart, a repentance which is deeply spiritual, and yet can keep buildings and infrastructures from collapsing. Come and join Jesus in culture-jamming penitence (liberating it from old-fashioned and tendentious religious prejudices). For too long, "repentance" and "penitence" have been into individualistic exercise, to keep people down, to make them isolated, submissive and obedient... That was not what Jesus meant! His repentance was action driven, change oriented, collective exercise, in their time to change building codes, in our times opposing injustices of our society for instance by addressing and challenging the city housing and homeless policy. All of the Synoptic Gospels (Mark, Matthew, Luke) record Jesus predicting the fall of the temple and Jerusalem. 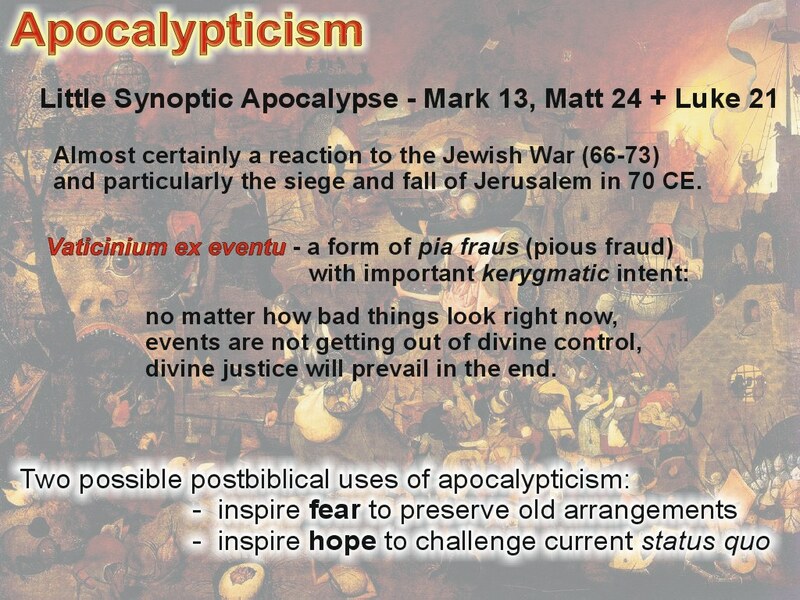 This lengthy discourse is traditionally called a Synoptical Apocalypse. It is widely accepted that Jesus was an eschatological thinker, he did not expect the world in its current corrupted shape to exist for much longer. 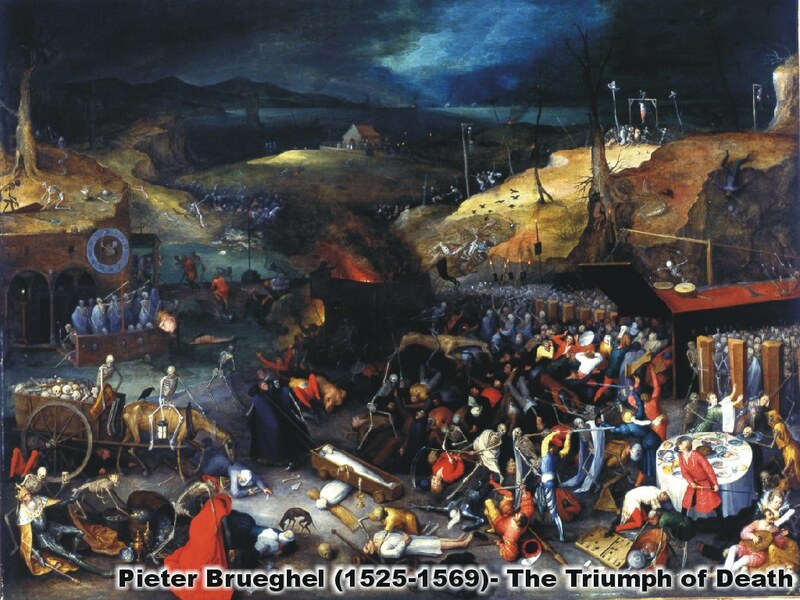 He anticipated sudden divine revolutionary intervention in the course of civilization. 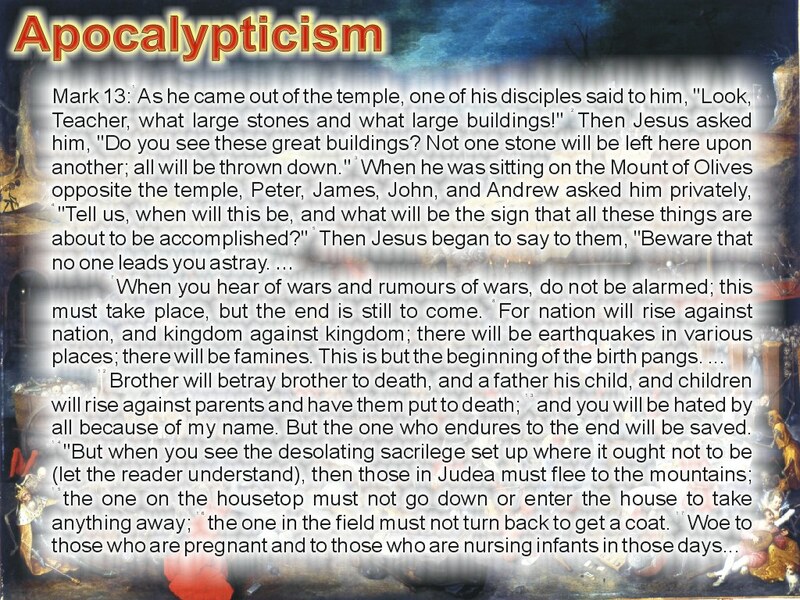 This Synoptical Apocalypse on the other hand is unlike any of his other parables, pronouncements or teachings. It is a different length, and more importantly, it is of a different genera. Indeed it follows then popular literary form of apocalypse. This slide presents an elemental vocabulary for this particular area of the theological thinking. 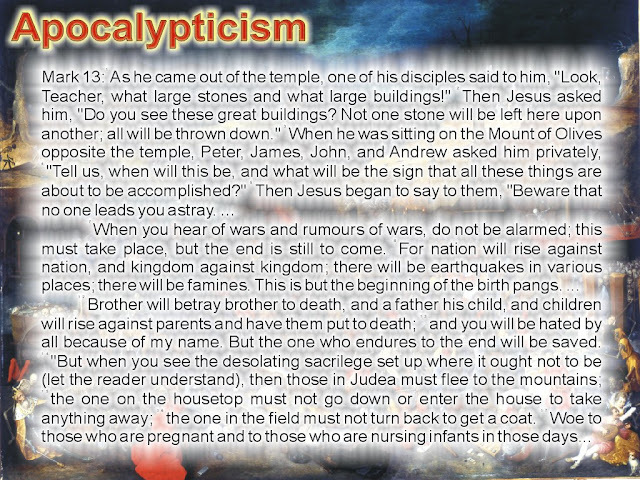 As indicated in the last sentence, apocalypticism was one of the attempts to solve the problem of theodicy. In Hellenistic times Judaism reaches the final stages in the development of a strict transcendent monotheism (The LORD is the only god, who is omnipotent, omniscient creator and guarantor of justice). That creates the twofold problem. This monotheistic religion is quite intolerant of other surrounding faiths and occasionally it bubbles up into brutal repression based on faith. This persecution then created a jarring discrepancy between monotheistic faith and world reality. How could brutal persecution of the faithful be squared with the very faith in an omnipotent, omniscient, just and benevolent deity. In answer to this conundrum Judaism under the Seleucid empire (in the 2nd century B.C.E.) 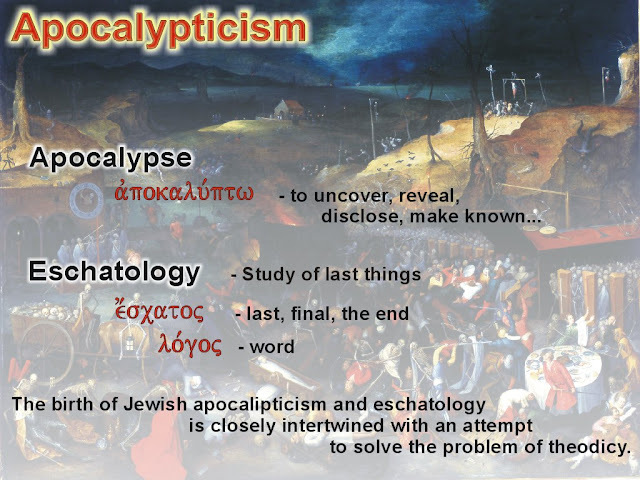 generated religious concepts of resurrection (restoration of the just) and eschatology (restoration of justice) closely associated with the genera of apocalypticism - in disclosure of the final matters. I illustrate this lecture with predominantly Renaissance art. It is to hint at some of the cultural and historical impacts of ancient apocalyptic visions. 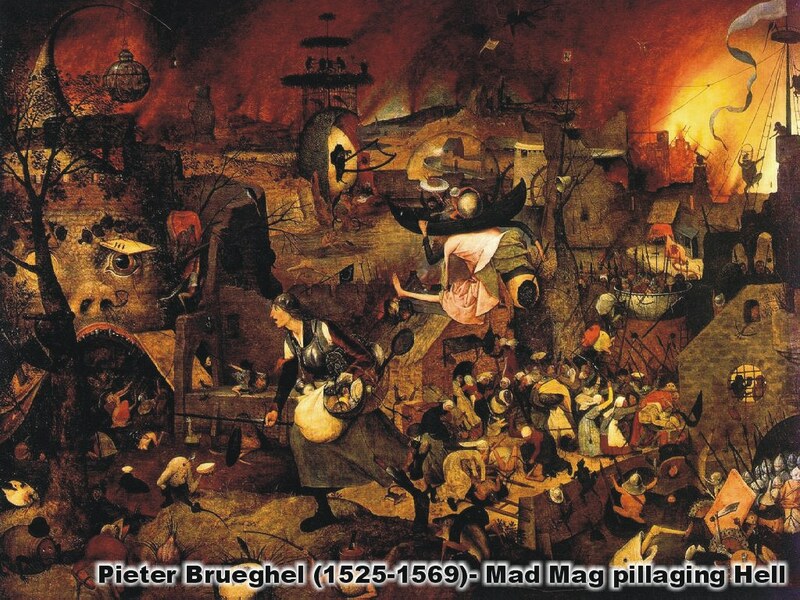 Interestingly, art often functions as an alternative window to anticipate and portray crises in the broader society. On the other hand, this painting comes from a different era. Its pietism is somehow histrionic, but less conflicted and brutal. 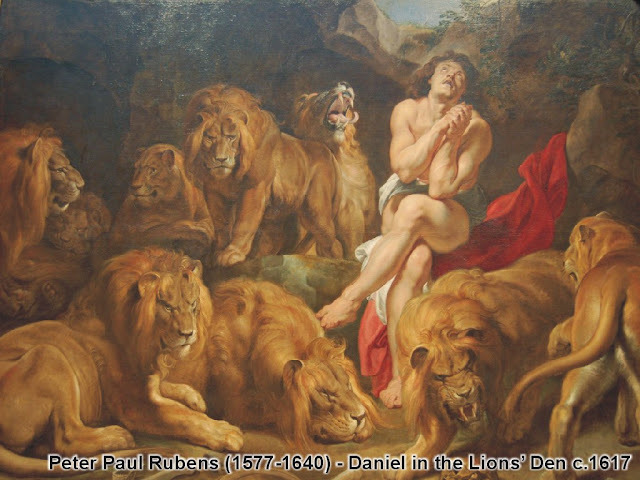 Interestingly there are many art pieces inspired by the first half of the Book of Daniel - a collection of tradicional miraculous stories of deliverance - and there is hardly any artwork based on the second half of Daniel’s apocalyptic visions. 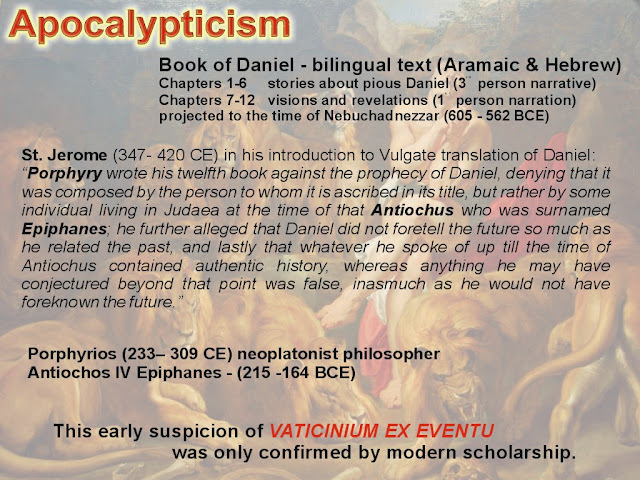 The book of Daniel is a theologically schizophrenic book. It aspires to inspire faithfulness to monotheistic faith under persecution. The first half contains a collection of stories of traditional miraculous deliverances. While the second half gives up hope in piecemeal miraculous interventions and concentrates on the end of the time eschatological answer to persecution. From a very early time there were serious doubts about the dating of the book of Daniel. Clearly the apocalyptic part of the book of Daniel was written to help to reconcile the persecution of the Seleucid empire with a belief in a benevolent and just deity. The current state of injustice (which is was “predicted”) is temporal; persecution does not disprove faith, and the final reckoning is at hand. This is achieved by the book pretending to be much older and foretelling the future, while it is actually reporting the past, a clear example of prediction after the fact. This is another famous and marvelous example of the artistic depiction of apocalypse, a dark age of war and violence being brought to an end by sudden arrival of Christ with the era of light and justice. The most widely known example of apocalyptic literature (the book of Revelation) also contains clear signs of retroactive clairvoyance (this time Christian). By predicting after the fact the persecution of Nero, it attempts to encourage recipients under later persecutions (either Domitian or any later emperor). 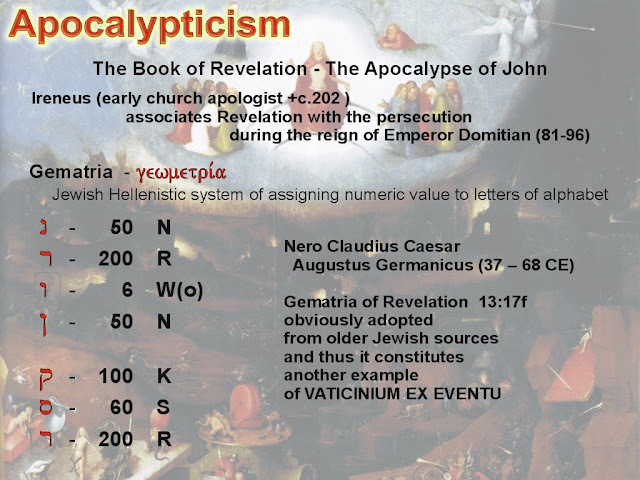 The book of Revelation certainly does not date from the time of Nero, that would make it the oldest New Testament text next to the original Pauline letters (this would be impossible to harmonize with its content, language and context). Our final artwork reflects again the Renaissance bizarre and expressionistic imagination. We come back to the Synoptical Apocalypse. 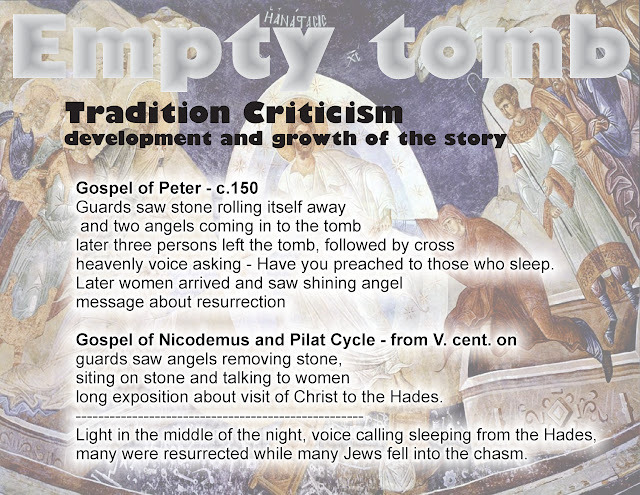 In its final form in our current synoptical gospels it is almost certainly an answer to the destruction of Jerusalem. 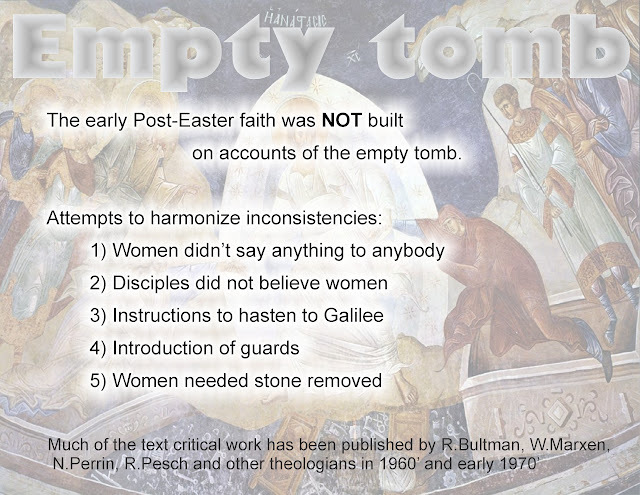 It does not exclude the fact, that Jesus himself was influenced by eschatological thinking. 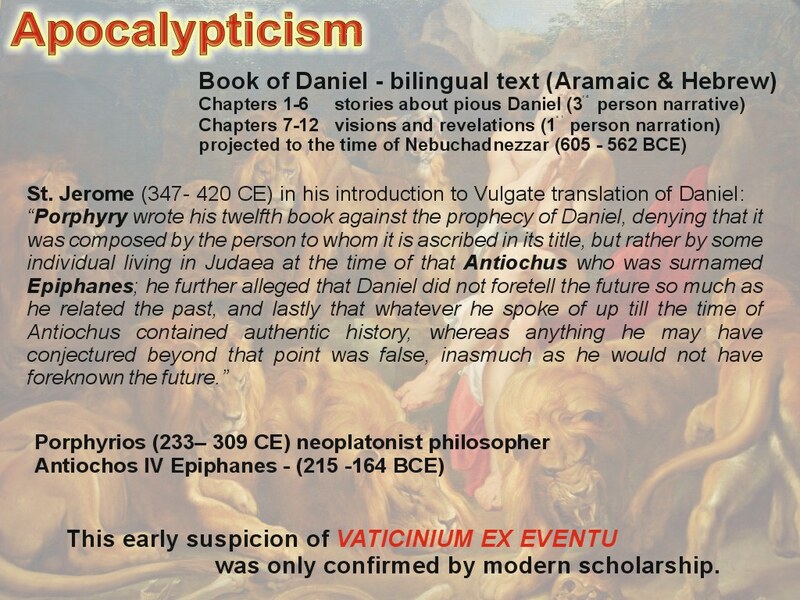 Synoptical apocalypse in its current form is a clear example of postdiction - “vaticinium ex eventu.” Pretending to reflect a future which had already occurred. While it certainly represents an example of a pious lie, it also clearly shows that the original intentions were positive and helpful. This is our last slide today. Unfortunately way too often brutal apocalyptic images of destruction are used by conservative religious circles, sects and political forces to instill fear and preserve the current status quo. Surprisingly, throughout history, apocalypticism often played quite a positive role of a highly creative force. It was so, because apocalypticism did not shy away from acknowledging and recording the reality of the world. It captured it with raw, almost brutal honesty, yet, at the same time it presented the visions of an alternative, more harmonious, just and benevolent divine world. 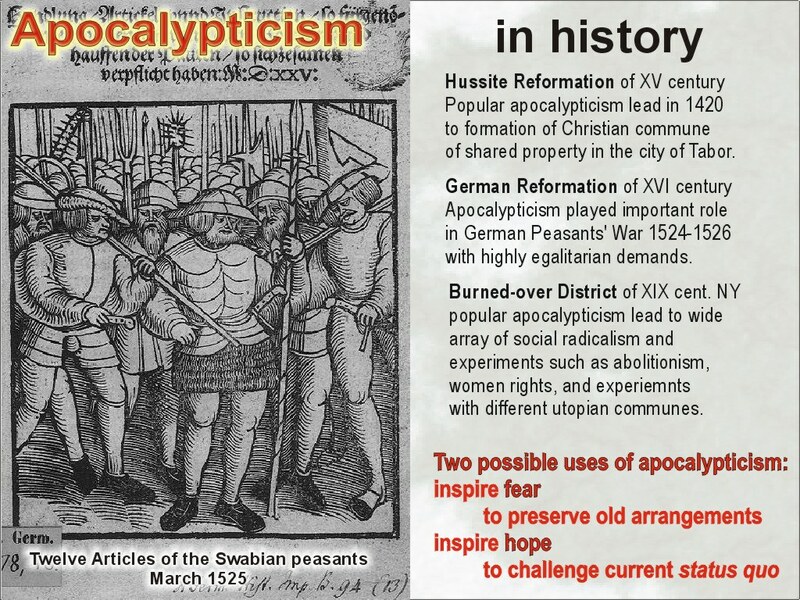 This contrapuntal feature of apocalypticism allowed people throughout the history to criticize the current status quo and envision alternative arrangements. Thus apocalpticism can have two functions, 1) conservative control by fear, or 2) fostering revolutionary dreams. You might know me well enough to guess which form of use I find truer to the original intention and congenial to us today.